I introduced my mom to Akasaka for her birthday a couple months ago. She's a huge lover of sushi and my dad is a huge lover of food-that-doesn't-cost-a-lot-of-money-but-is-plentiful. That being said, Akasaka is a great combination of both! The chirashi bowl is the biggest seller. The very first time I went there, I thought I could eat an entire bowl by myself. It destroyed me. And then it destroyed me this time as well. Chirashi Bowl - 2, ChouDown - 0. All this for five people? We definitely over-ordered. The chirashi bowl may not look like much from my above-shot pictures, but that bowl is DEEP (there's a better picture from Yelp here). There must be ten slices of just salmon sashimi in it, along with tuna, yellowtail, albacore, spicy tuna, octopus salad, shrimp/crab salad, a sweet shrimp, a scallop, large fish roe, and uni. There are probably a few more items that I'm forgetting. Brother thought that the chicken and grilled fish would be smaller, appetizer sized portions. The waitress should have warned us before we got all this food! Fail. The place gets super busy and packed, but you can call and make reservations ahead of time. I strongly suspect there is only one sushi chef and she has to work like a madwoman. When we first got there it was ok, but as the dinner hour went by it got more and more insane. At the end, it took us 20 minutes to get the check. Brother was enraged but since he was only rushing to get home so he could watch a streaming Starcraft 2 tournament, I wasn't too concerned. This post is long overdue, as The Walking Dead went on its mid-season hiatus on November 27th. What a ride it's been. The barn!!! I hope everyone has had a chance to catch up, as the show just keeps getting better and better. I'm impressed with what they've come up with so far, but know that there are plenty of plot points in the comics that will probably not make it to cable television (kids killing kids, zombie pedophilia, etc - I know, totally messed up, right?). Since this episode was after Thanksgiving and I had copious amounts of turkey left over in the refrigerator, I made a turkey pot pie. This was the first time I tried making a pie and was pleased at the results actually! Umm except I didn't make the pie dough from scratch. I'm a bad cook. Needless to say, I can't wait for the next season. Mark your calendars! February 12th hails the triumphant return. I can't wait to see what they have in store. If you haven't started watching, give it a go. The first season was only six episodes. The people I've gotten turned onto the show were at first hesitant because they didn't like blood/gore but there's really not all that much of it - the show is based more on the characters and their flaws and the way they handle the situations presented to them. Preheat oven to 425F. Gently unroll one pie crust and smooth into the bottom of pie pan, pushing out all air bubbles. Trim any excess crust around the edges. Place 2 tablespoons of the butter in a large skillet over medium high heat. Add the onion, celery, carrots, parsley, oregano, salt and pepper. Cook about five minutes, or until softened. Stir in the broth. Bring mixture to a boil. Add potatoes, and cook until tender but still firm, about 15-20 minutes. In a medium saucepan, melt the remaining 2 tablespoons butter. Stir in the turkey and flour - it will be pasty. Add the milk, and heat through. Combine the turkey mixture into the vegetable mixture, and cook until thickened. Salt and pepper to taste. Pour mixture into the unbaked pie shell. Gently unroll the top crust, and place on top of filling. Crimp edges underneath and press around the edges of the pie pan to seal. Cut off any excess crust. Make 4 slits (or cut out a couple shapes with cookie cutters) in the top crust to let out steam. Place pie on top of a baking sheet to catch any filling drippings, in case of bubbling or overflow. Bake for 15 minutes. Reduce oven temperature to 350F and continue baking for another 20 minutes, or until crust is golden brown. Hello handful of readers out there in the Internet universe. Sorry for the hiatus, as the first of December was my birthday (one year older, one year sadder) and then I had to make an emergency trip out to Boston. Boyfriend's mother passed away and we flew out immediately so he could be with family. After spending a week there, we arrived back in Los Angeles this past Saturday morning. While he has not returned to work yet, I started up again today ... and got a traffic ticket while driving to work. Needless to say, it's been a trying week. However, I shall not shirk my duty in participating in my first ever #FBCookieSwap! Hosted by Lindsay at Love & Olive Oil and Julie at The Little Kitchen, it was a great virtual networking event with mouthwatering rewards. A ton of bloggers sign up, and are randomly matched by Lindsay and Julie. After receiving my matches, I send out a dozen cookies to each blogger. In return, I receive three one-dozen sets of cookies in the mail from other bloggers. It's been really fun getting boxes in the mail, and not knowing what cookie deliciousness would be waiting within it. For my recipe, I fell back upon a recipe that I remember making when I was in high school and was just learning and experimenting with baking. I don't even remember where the recipe came from, but I remember it was a white paperback book with a picture of a chocolate chip cookie on the front. Specific huh? Cookies were rolled and baked while the winds raged outside. I live in the San Gabriel Valley and the winds were screechng at 80 miles per hour. The overhead fan on the stove was spinning of its own accord; it was super creepy. I'm glad the cookies came out nicely! And I cushioned the hell out of the packages with parchment paper too; when I received Susie's cookies, they came to me in a hundred pieces ... albeit a hundred delicious pieces. In a medium saucepan, melt butter over low heat. Remove from heat and stir in molasses and vanilla. In a medium bowl, sift flour with 1 cup sugar, baking soda, ginger, cinnamon, nutmeg, cloves and salt. Whisk to combine. Add beaten egg to cooled butter mixture and mix well with fork. Using a rubber spatula, fold flour mixture into butter mixture. Cover saucepan and refrigerate until firm enough to form balls, about 15 minutes. Preheat oven to 375F. Put remaning 1/3 cup sugar into a small bowl. Scoop out walnut size pieces of dough and roll into 1 inch balls (I used a small ice cream scoop for uniform cookies). Toss dough balls in sugar to coat and place 2 inches apart on ungreased cookie sheets. Leave out for 15 minutes to let the dough defrost a bit. Bake 12-15 minutes or until centers are no longer raw. This is approximately 12 minutes for soft and chewy cookies, or 15 minutes for crisp cookies. Cool on cookies for 5 minutes. Transfer to wire rack to cool completely. Store in airtight containers. And of course, I received three dozen cookies in the mail as well! They were all varied and delicious. Boyfriend and I enjoyed them immensely with cups of tea and coffee. I can't wait to find the recipes for them so I can make them myself at home! Loved the idea of this! My friends were a bit apprehensive in the beginning ... "You mean total strangers are going to send you cookies? What if they're poisoned or you get salmonella?" ... but no worries, I ALWAYS made Boyfriend eat a cookie before me. And I waited five minutes too, just to make sure he wasn't keeling over or vomiting or foaming at the mouth. I know, I'm the best. This was a great experience, and it's great to see the foodblogging coming together like this. 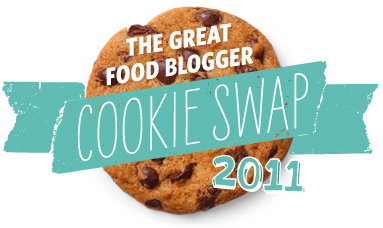 I'm glad I was able to participate in the first ever Great Food Blogger Cookie Swap and totally look forward to participating every year. If you want to participate next year also, you can sign up here. Join in, maybe we will end up sending cookies to each other in 2012!